A maintenance window for Radius has been scheduled for Saturday, March 9 from 10:00pm to 11:00pm PT. Since our servers will be worked on during this time frame, Radius users may not be able to access the site or complete tasks during this one-hour window. A maintenance window for our Mathnasium University provider has been scheduled for Saturday, March 9 from 12:00am to 6:00am PT and 9:00pm to 3:30am PT. There may also be a third window on Sunday, March 10 from 12:00pm to 4:00pm PT. It is recommended that you do not create new employee records in Radius or use Mathnasium University during these hours to prevent issues. Our Development Team has been working hard to improve the structure and function of Monthly Sessions in Radius, and we are excited to provide a summary of these improvements that will be released on February 28, 2019. #1: Monthly Sessions will restart on the 1st of each month, not on the Billing Day. Right now in Radius, any student who is enrolled in the Monthly Sessions membership type has their monthly sessions restart on the Billing Day. This will change beginning March 1, 2019. Monthly Sessions enrollments will have the session count reset on the first of every month. 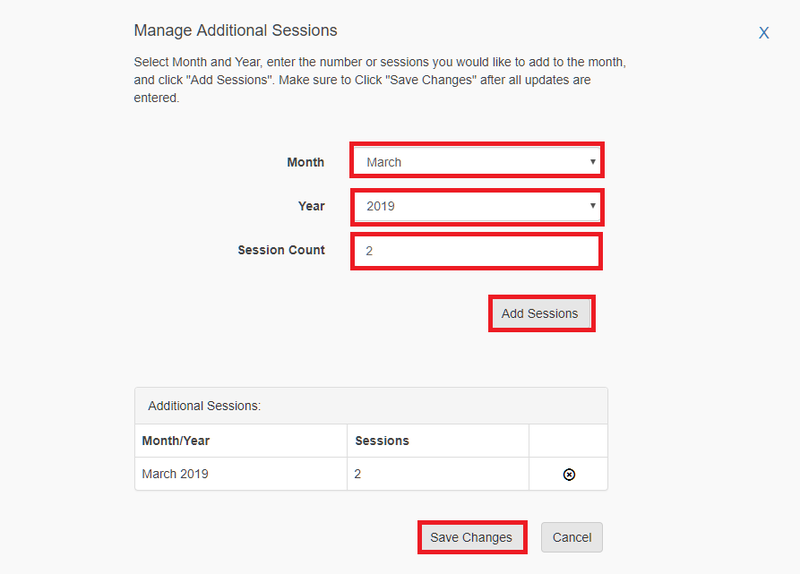 Once you go to add an enrollment, select “Monthly Sessions” from the Membership Type dropdown. 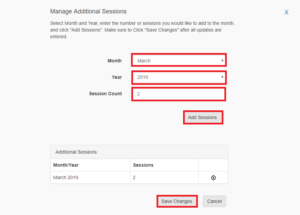 Enter the number of sessions allowed for the first month in the “First Month’s Sessions” field. Provide any further information for this enrollment. Once you click on “Edit” next to any student’s active enrollment, you can then click on the “Manage Additional Sessions” link located below the “Notes” section of the “Edit Enrollment” pop-up window. Select the Month and Year to apply the additional sessions to. Enter the number of sessions you would like to add to the enrollment for the specific month selected. Click “Add Sessions”. You will see an update in the table below. 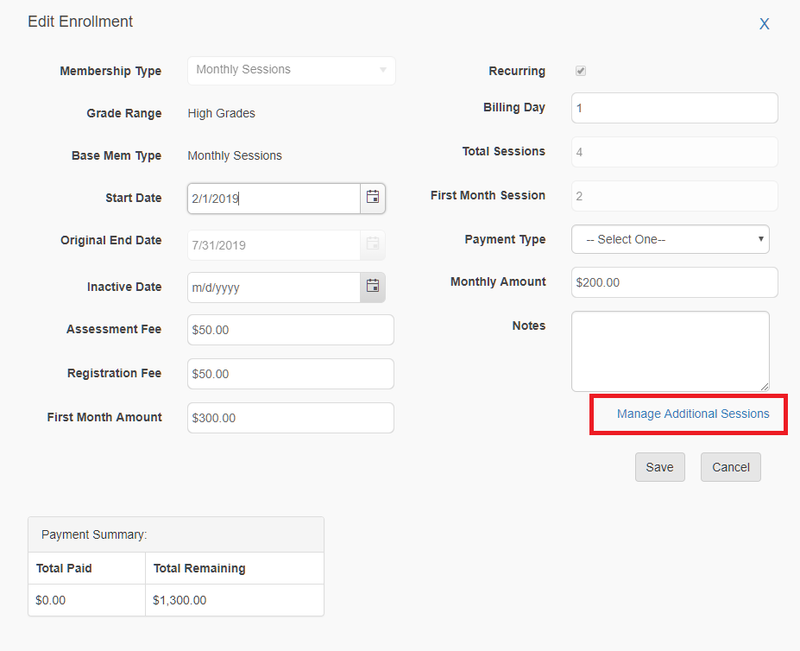 Click “Save Changes” to apply the additional sessions to the enrollment. 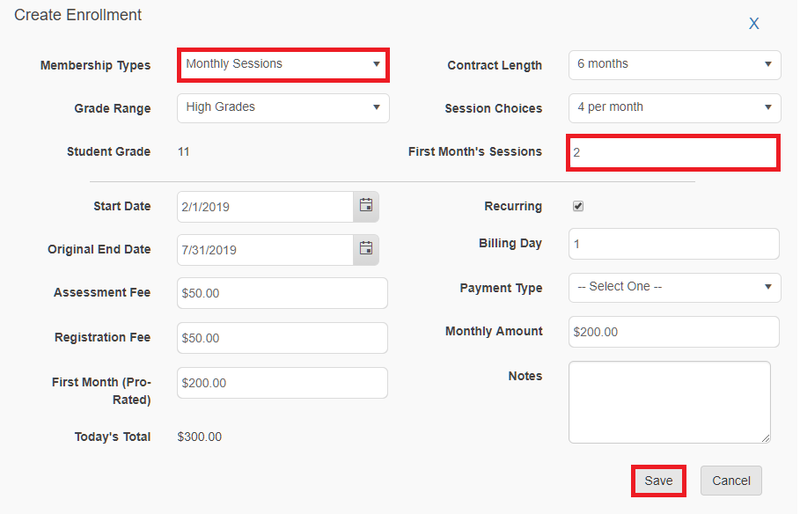 Under the Enrollments grid on the Student Details page, you should now see a “+” sign in parentheses with the number of additional sessions next to the already agreed upon number of monthly sessions. Please review the following Radius Release Notes that highlight the fixes that are going to be released on Thursday, February 21 during the three-hour window of 6:00am to 9:00am PT. Excel Exports: Fixed Excel exports for Student Management and Guardian Management where certain fields (e.g., Teacher Consent, Email Opt-out) would yield blank columns. Lead Conversion Report: Fixed issue in Lead Conversion Report where the columns “Lead Conversion Date” and “Lead Created Date” were not sorting properly. 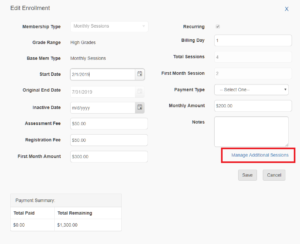 Enrollments: Fixed issue where an unhelpful error message would populate when a user would edit a student enrollment and try to save a First Month’s Amount that would be less than the total of the Assessment Fee and Registration Fee. Send Email: Fixed issue in “Send Email” feature where emails could not be sent if there were trailing white spaces after the email address(es) being sent to. Student Check-In: Fixed issue in Student Check-in where students with the same first name were not being further sorted by their last names. Assessment Chart: Fixed issue where an error would show up on an Assessment Results chart if any questions were excluded. Performance: Performance has been improved for My Activities (with Center Activities checked) and for Calendar. Status Filter: Fixed issue in My Activities where the Status filter wasn’t working correctly for Events. My Activities: All Activities from every module that has assigned Activities (including Schools, School Contacts, and Community Contacts) will now show up in My Activities searches. All events from all modules will now also show up in Calendar. Activity IDs: All Activities, no matter where they originate, will be stamped with an ID that ties them to their center, thus allowing them all to show up in lists and reports that rely on this information in order to display them. Where appropriate, Activities will also be stamped with a Completed Date, which again will allow them to show up in lists and reports that rely on it. Attendances: Fixed issue where Student Roster would allow more attendances to be added for students in past months when all the sessions had been used up. 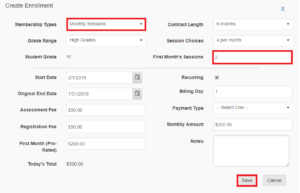 Sessions Remaining: Fixed issue in Student Roster where the “Sessions Remaining” column would show a blank instead of a 0 when current month’s sessions were used up. Progress Report: Fixed issue in Progress Report Manager’s Current Batch Details and in Progress Report Preview where items that were Mastered but did not have an Assigned Date were not being counted as Mastered (this scenario most commonly arises from the completion of Progress Check items). Add Student: When adding/editing a student record, selecting the Account the student is attached to should now set the center and automatically drive what schools populate the “School” drop-down list. Reminders: Fixed issue where deleting an activity with a live reminder wouldn’t make the reminder disappear until you refreshed the page. Guardian Management: Fixed issue on Guardian Management where after a search was run, the footer of the grid wouldn’t expand to match the possible new width of the grid. Conversion Date Column: Fixed issue in Referral Report where Conversion Date column wasn’t sorting properly. Conversion Date Time Stamp: Fixed issue in Referral Report where the Conversion Date was showing the un-localized UTC date/time stamp. Comparison Chart: Fixed issue where users couldn’t save a grouped assessment’s comparison chart as a resource. Error Message: Fixed issue where attempting to group an assessment with results with an assessment without results yielded the wrong, less informative error message. Just a reminder, there was a release in Radius today, January 24th. If you do continue to experience any further issues after taking these steps, please reach out to Mathnasium Support (support@mathnasium.com). Please click “Read more…” below to read step-by-step instructions on how to create a Radius User Account. A maintenance window for Radius has been scheduled for Saturday, January 12 from 10:00pm to 11:00pm PT. Recently, our Development Team updated Radius in order to increase the site’s security and restrict unauthorized access. The introduction of these improvements has caused some users to be locked out of their accounts, which our team is currently in the process of investigating. If you are locked out of your Radius user account and are not able to reach Mathnasium Support, please use the “Forgot Password” feature for now as this will unlock your account and allow you access again. We hope that everyone has a safe and happy new year! A maintenance window for Radius has been scheduled for Wednesday, December 26 from 7:00-11:00am PT. We are performing a system-wide update to improve several areas within the back end of Radius. During this time, Radius will still be accessible. Since the site will be under maintenance during this time frame, users may experience interruptions during this four-hour window. This system maintenance was scheduled during the holidays to coincide with lighter operational patterns. In the newly designed Progress Report, there are three sections at the top of the report that help parents understand their child’s progress at Mathnasium: ‘Total Learning Plan Progress Based on…’, ‘Completed in the Last Month’, and ‘In Progress.’ In the initial release of the report, the total number of ‘Skills Mastered’ in the top section of the Progress Report included supplemental topics (i.e. WOBs). After further review, our team has decided to adjust this section to provide the total number of skills mastered based on topics generated from active learning plans only. Our team implemented this update in Radius today, December 14 to correct the initially implemented design. Now, the number of ‘Skills Mastered’ includes only those topics that are in the active Learning Plan(s) as a result of the student’s assessment(s). Thus, only assigned items that are not supplemental topics, are marked as ‘Completed’, and have a check in the ‘Mastered’ column on the Learning Plan are being considered in this section. Due to the recent issues with LP Bulk Printing from the latest release in Radius, we have temporarily reverted back to our original server structure. Our aim to revert back for now is to prevent further interruptions to center operations while providing sufficient time to the Development Team to investigate this issue further. As a result of reverting back to our old server structure, bulk printed materials will not display the Mathnasium watermark at this time. We will notify all Radius users once a resolution has been determined by our team. If you have any questions, please contact Mathnasium Support via email at support@mathnasium.com.